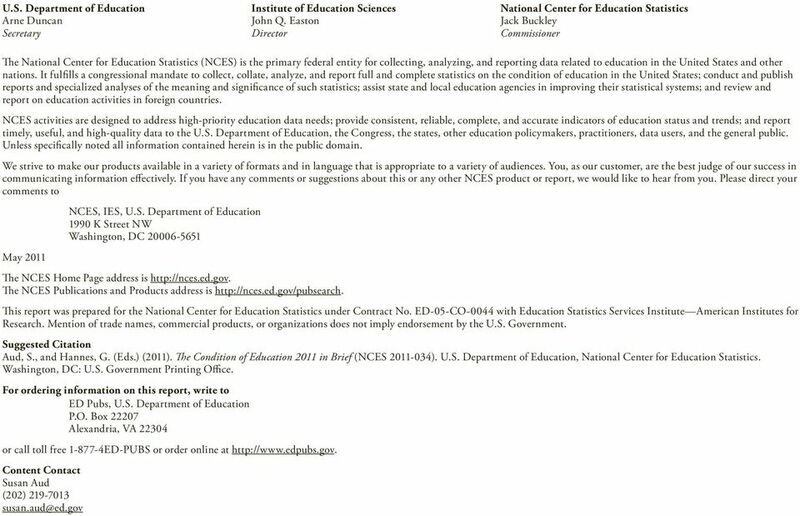 Download "NCES 2011-034 U.S. DEPARTMENT OF EDUCATION"
5 What s Inside This publication contains a sample of the indicators in The Condition of Education To order the entire printed edition of The Condition free of charge, call ED Pubs ( ED-PUBS). The indicators in this publication are numbered sequentially, rather than according to their numbers in the complete edition. The Contents page offers a cross-reference between the two publications. 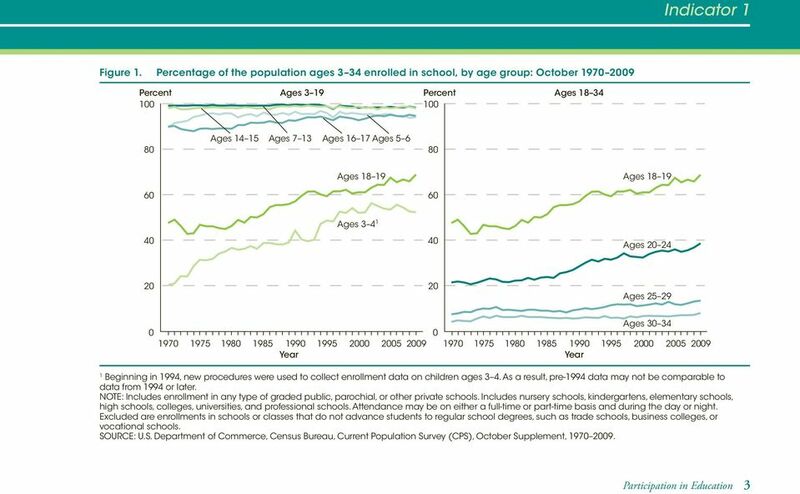 Since 1870, the federal government has gathered data about students, teachers, schools, and education funding. 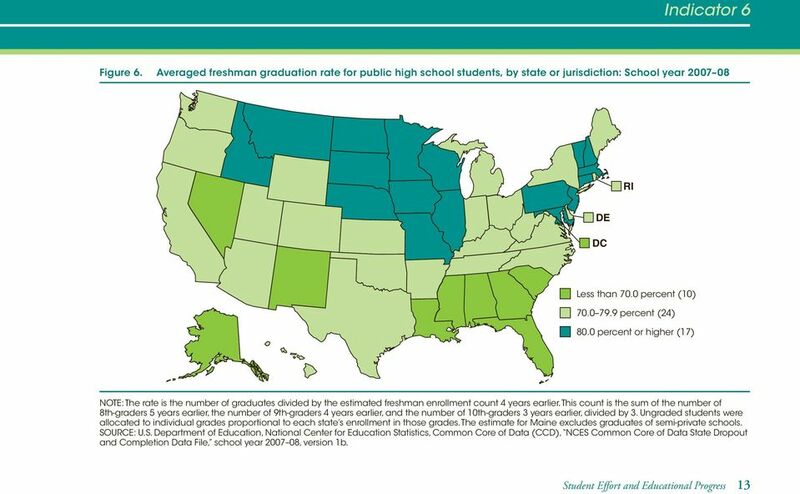 As mandated by Congress, the U.S. Department of Education s National Center for Education Statistics (NCES) in the Institute of Education Sciences annually publishes a statistical report on the status and progress of education in the United States. 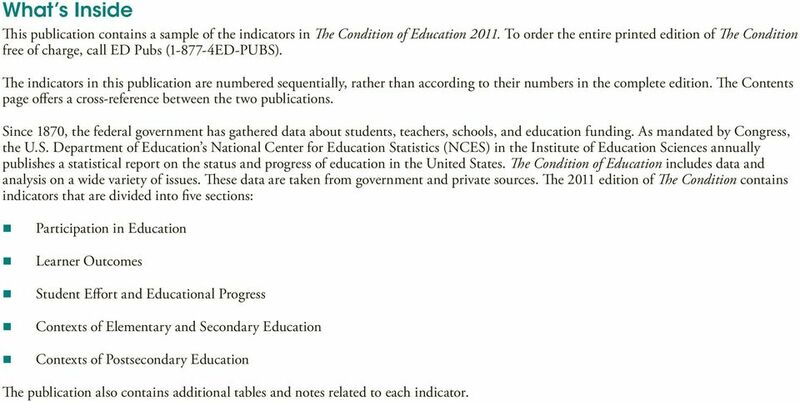 The Condition of Education includes data and analysis on a wide variety of issues. These data are taken from government and private sources. 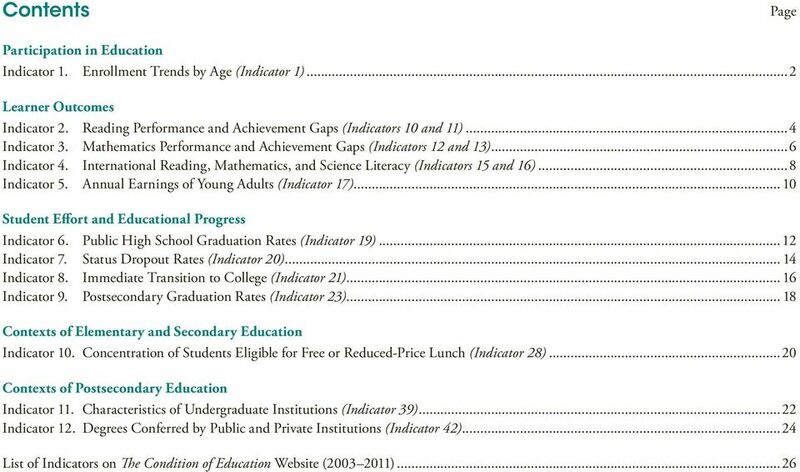 The 2011 edition of The Condition contains indicators that are divided into five sections: Participation in Education Learner Outcomes Student Effort and Educational Progress Contexts of Elementary and Secondary Education Contexts of Postsecondary Education The publication also contains additional tables and notes related to each indicator. 12 Indicator 3 Mathematics Performance and Achievement Gaps From 1990 to 2009, average grade 4 mathematics scores increased by 27 points and average grade 8 scores increased by 20 points. 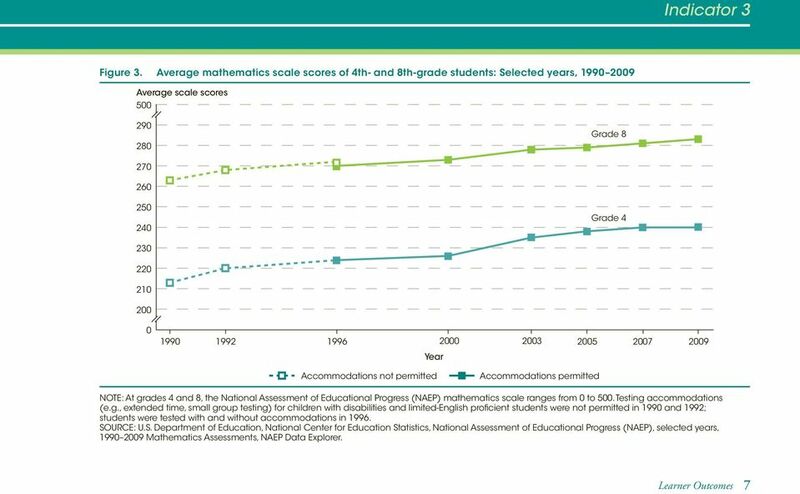 At grade 12, average scores increased by 3 points between 2005 and In 2009, the average National Assessment of Educational Progress (NAEP) mathematics scale score for 4th-grade students (240) was not measurably different from the 2007 score, but was higher than the scores on all of the assessments given between 1990 and The average score for 8th-grade students in 2009 (283) was higher than the average scores in all previous assessment years. From 1990 to 2009, average grade 4 and grade 8 mathematics scores increased by 27 and 20 points, respectively. 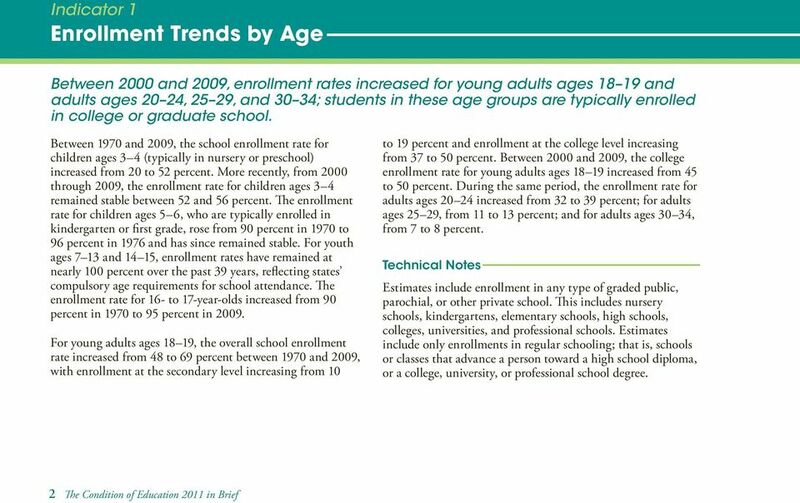 The average 12th-grade mathematics score was 3 points higher in 2009 (153) than it was in 2005, the year the assessment was first given. At grade 4, the average mathematics scores in 2009 for White, Black, Hispanic, Asian/Pacific Islander, and American Indian/ Alaska Native students were not measurably different from their scores in However, the 2009 scores for White, Black, Hispanic, and Asian/Pacific Islander 4th-grade students were higher than their scores from assessment years prior to Black 4th-grade students scored 26 points lower than their White peers in This gap was not measurably different from that in 2007 but was smaller than the gap in 1990, when the average score of Black 4th-grade students was 32 points lower than that of their White peers. 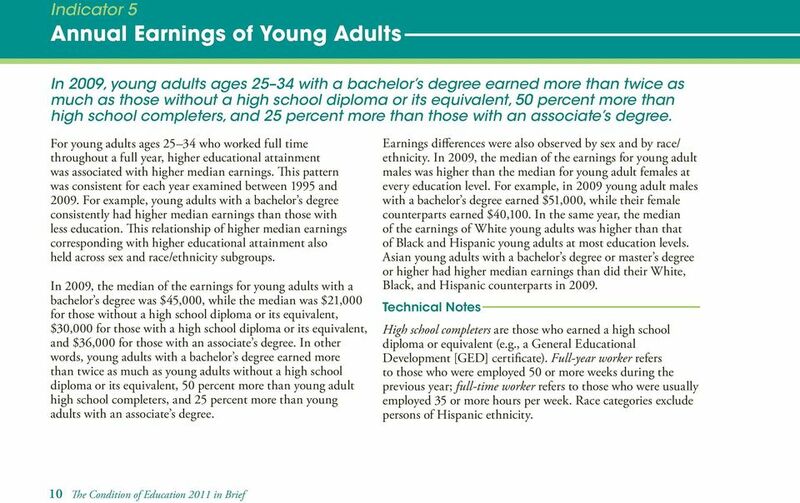 The 21-point achievement gap between White and Hispanic 4th-grade 6 The Condition of Education 2011 in Brief students in 2009 was not measurably different from the gap in 2007 or the gap in At grade 8, average mathematics scores were higher in 2009 than in 2007 for all racial/ethnic groups except American Indians/Alaska Natives. 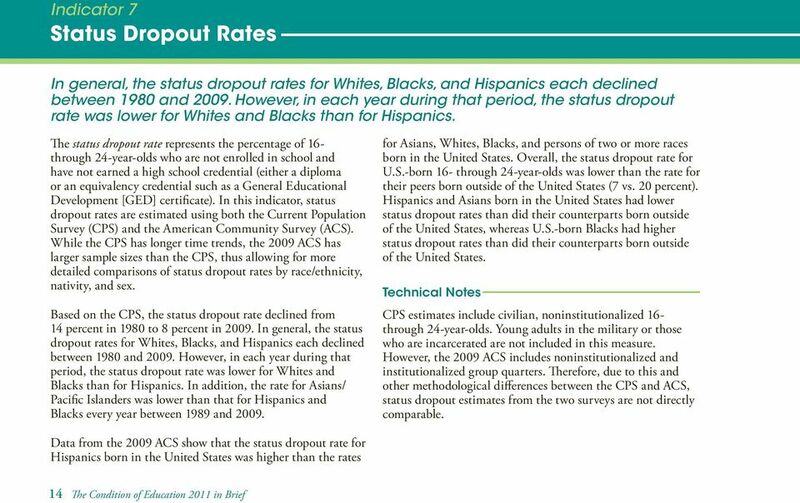 Black and Hispanic 8th-grade students scored lower than their White counterparts in 2009, by 32 and 26 points, respectively; neither of these gaps was measurably different from the corresponding gaps in 2007 and At grade 12, average mathematics scores were higher in 2009 than in 2005 for all racial/ethnic groups. In 2009, White 12th-grade students scored 30 points higher in mathematics than Black students and 23 points higher than Hispanic students. 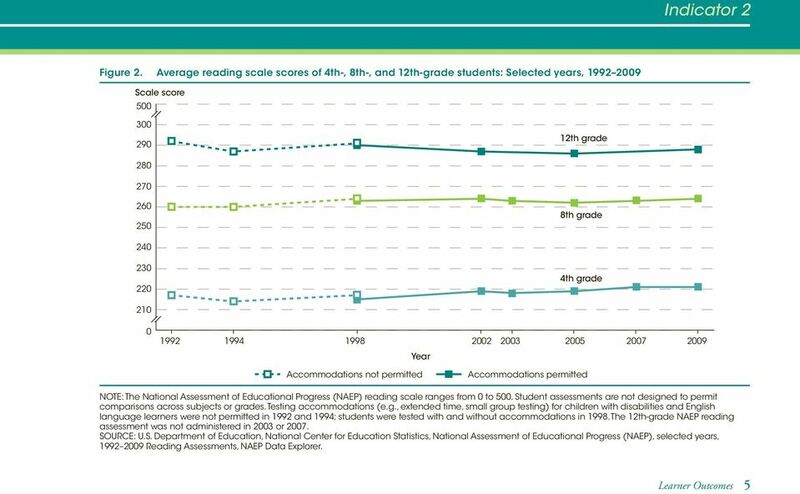 Neither gap was measurably different from the corresponding gaps in Technical Notes NAEP mathematics scores range from 0 to 500 for grades 4 and 8. The framework for the 12th-grade mathematics assessment was revised in 2005; as a result, the 2005 and 2009 results cannot be compared with those from previous years. At grade 12, mathematics scores on the revised assessment range from 0 to 300. Race categories exclude persons of Hispanic ethnicity. 14 Indicator 4 International Reading, Mathematics, and Science Literacy In 2009, the average U.S. combined reading literacy score and the combined science literacy score for 15-year-old students were not measurably different from the average score of the 34 OECD member countries, while the average U.S. mathematics literacy score was below the OECD average. 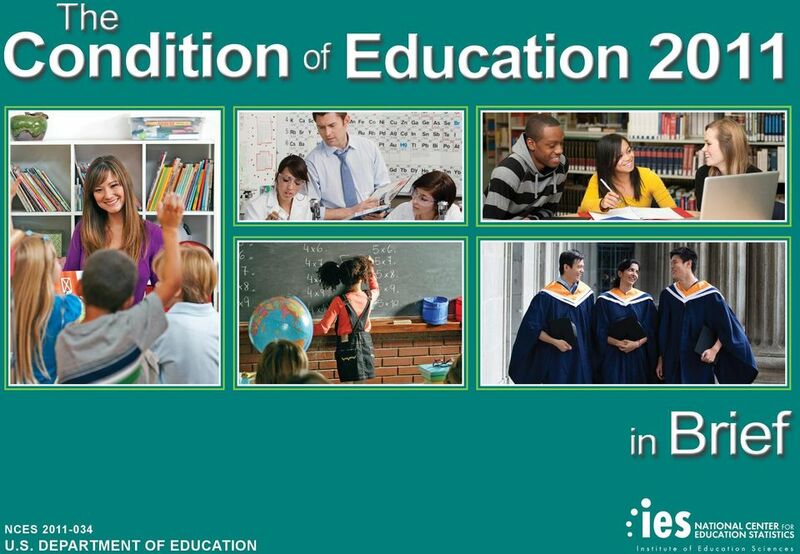 The 2009 Program for International Student Assessment (PISA) reports the performance of 15-year-old students in reading, mathematics, and science literacy in 65 countries and other education systems, including the 34 Organization for Economic Co-operation and Development (OECD) countries, 26 non-oecd countries, and 5 other education systems. The OECD countries are a group of the world s most advanced economies. Other education systems refer to non-national entities, such as Shanghai-China. 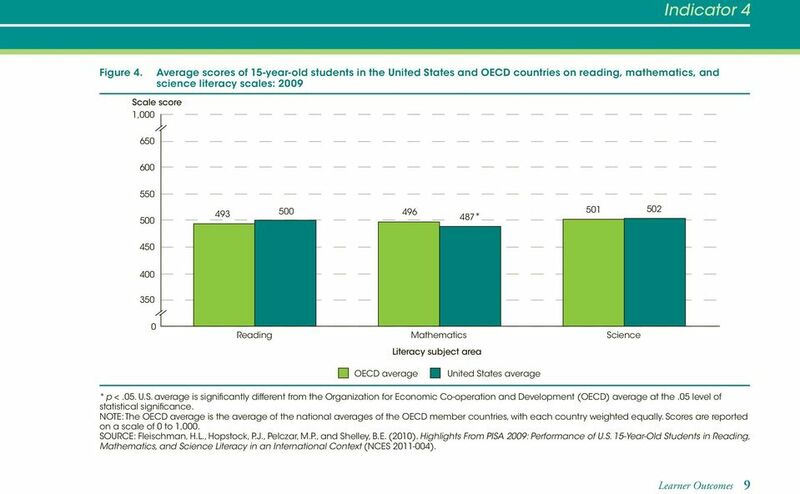 The U.S. students average score on the combined reading literacy scale (500) was not measurably different from the average score of OECD countries (493). Compared with the other 64 countries and other education systems, the U.S. average was lower than the average in 9 countries and other education systems (6 OECD countries, 1 non-oecd country, and 2 other education systems) and higher than the average in 39 countries and other education systems (13 OECD countries, 24 non-oecd countries, and 2 other education systems). 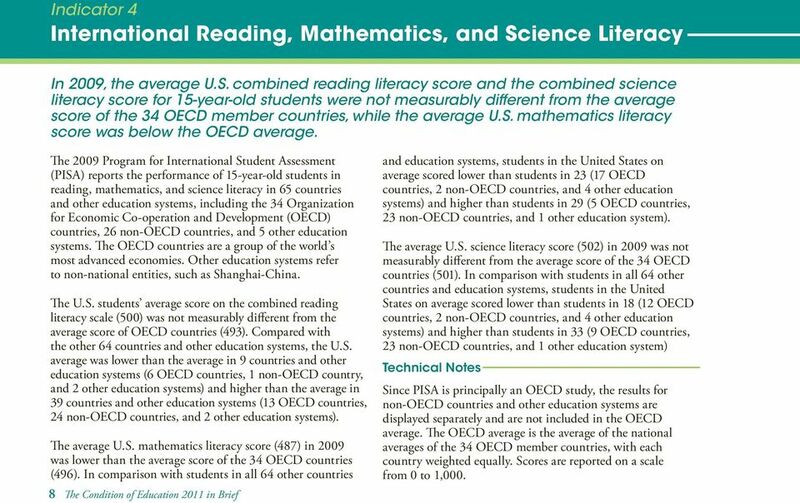 The average U.S. mathematics literacy score (487) in 2009 was lower than the average score of the 34 OECD countries (496). 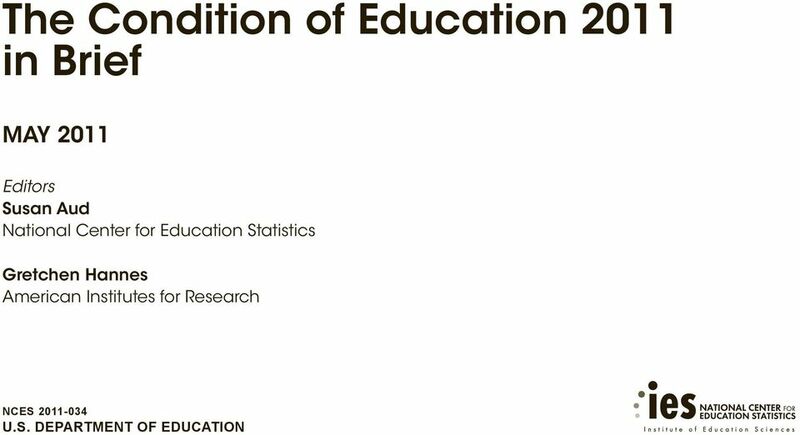 In comparison with students in all 64 other countries 8 The Condition of Education 2011 in Brief and education systems, students in the United States on average scored lower than students in 23 (17 OECD countries, 2 non-oecd countries, and 4 other education systems) and higher than students in 29 (5 OECD countries, 23 non-oecd countries, and 1 other education system). The average U.S. science literacy score (502) in 2009 was not measurably different from the average score of the 34 OECD countries (501). 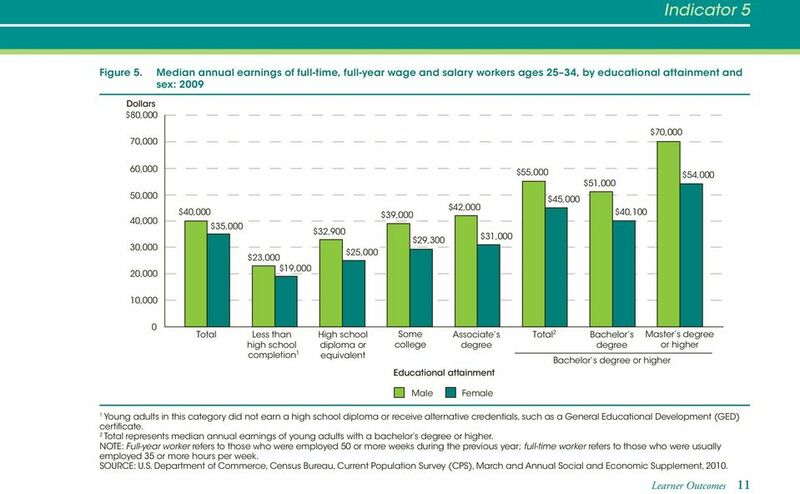 In comparison with students in all 64 other countries and education systems, students in the United States on average scored lower than students in 18 (12 OECD countries, 2 non-oecd countries, and 4 other education systems) and higher than students in 33 (9 OECD countries, 23 non-oecd countries, and 1 other education system) Technical Notes Since PISA is principally an OECD study, the results for non-oecd countries and other education systems are displayed separately and are not included in the OECD average. The OECD average is the average of the national averages of the 34 OECD member countries, with each country weighted equally. Scores are reported on a scale from 0 to 1,000.